sometimes there are just no words...&#*$! That is exactly why you need the Kelly Purkey Bleep die from Simon Says Stamp. This is the perfect greeting for a card to send to a friend when you just don't have the right words to say. But this die certainly sums it all up. Happy Monday! Time for a new challenge over on the Simon Says Stamp Wednesday Challenge Blog. 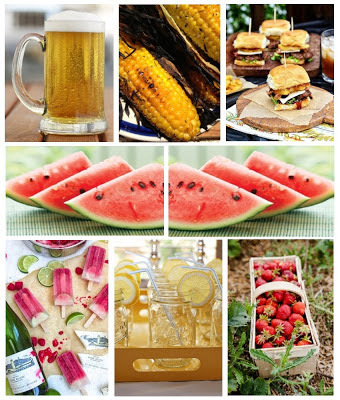 This week's challenge theme is Summer Food and Drink and the design team is using products from Hero Arts. There are so many fun things to choose from, but I am loving this Hero Arts Summer Lovin' set right now, and am always in the mood for a summer beverage! I was inspired by the frosty beverage right on top of the lovely inspiration board created for us by Joy this week. What a great collection of summer treats! Can't wait to see which one inspires your creation this week. Remember, just by playing along and linking up your project to the SSS Wednesday Challenge post you can qualify to enter a $50 shopping voucher to the Simon Says Stamp store. One lucky winner will be chosen at random, it could be you! I hope you get to join in on all the fun and play along with the challenge. I can't wait to stop by some of your blogs and take a peek at what you have made. Have fun! Make sure to check back each Wednesday for another fun challenge over at the Simon Says Stamp Wednesday Challenge Blog! Time for a new challenge over on the Simon Says Stamp Challenge Blog. This week's challenge theme is Things with Wings and the design team is using products from Studio Calico. If you couldn't tell from last week, I've been really into my stencils lately, and I love all of the great ones from Studio Calico, especially this Triangle one. Remember, just by playing along and linking up your project to the SSS Challenge post you can qualify to enter a $50 shopping voucher to the Simon Says Stamp store. One lucky winner will be chosen at random, it could be you! Make sure to check back each Wednesday for another fun challenge over at the Simon Says Stamp Challenge Blog! simon says stamp challenge: use washi tape! Time for another challenge over on the Simon Says Stamp Challenge Blog. This week's theme is WASHI TAPE and the design team is using all kinds of fun tapes!!!! You know this is one of my favorite products and I did not just use one roll but a whole suite of this fun Sweet Bella MT tape, which is my very favorite brand. Time to grab your favorite tape and make a card for this week's challenge. Just by entering you could win a $50 shopping voucher to Simon Says Stamp. That's a whole lot of washi!!! simon says stamp challenge: put a stamp on it! This month Simon Says Stamp celebrates STAMPtember™, and we are having a special week at the Simon Says Stamp Challenge Blog, with a design team member BLOG HOP! Each member of the Challenge Blog Design Team has created a special project to share with you. Each design team member is giving away a $25 gift voucher from Simon Says Stamp just for completing the hop and leaving a comment on each DT member's blog. The challenge theme for this week is Put A Stamp on It (it is STAMPtember™ after all) and the design team is also using washi tape on their creations. One lucky challenge participant will win a grand prize, a $100 gift voucher from Simon Says Stamp. A chance along the way to win a $25 gift certificate for hopping onto my blog (and the blogs of the other design team members and leaving a comment on each team member's blog). A chance to win the $100 grand prize voucher for entering our challenge over at the Challenge Blog. I love these two new sets from Lawn Fawn. The A Birdie Told Me set is perfect for making your own customized card. Wouldn't a little one love to get one of these with their name on it? And the Interlocking Backdrops were used in two ways...I used the arrow as a background element by stamping it on my card and I used the hexagons to make a faux washi tape strip. Please hop to my teammates' blogs. Each of them has a special handmade work of art to share with you and also more chances to win prizes along the way! Enter the "Put a STAMP On It!" Challenge and be sure to put a STAMP on it and you could be the lucky winner of our GRAND PRIZE $100 Simon Shopping Spree! The next stop on the blog hop is Dawny P's blog. Please make sure to hop along to all the blogs for a chance to win! When you reach the end of the hop, you will wind up on the Simon Says Stamp Challenge Blog (which is the place where you want to enter the challenge for the grand prize!!!). Thanks to all for hopping, if you happen to encounter a broken link along the way, you can go back to the beginning with links to everyone who is participating in the hop. It was a super busy weekend and so far a really busy week...but last night I got some time to sit down in the crafty space and do a little catching up. Can't wait to spend some time in the crafty space this weekend. If you are around on Sat at 4 PM EST, I am hosting a 90 minute scramble over on the Hero Arts flickr group which is guaranteed to be fun, and there is a fabulous prize to be won! Hope all of you Moms out there have a great Mother's Day! My classes have been scheduled for May and June! You can see the schedule here. I have added a new store to the list of places I teach and will be teaching at Paper Anthology in Kenvil, NJ. If you are in the area, I would love to see you in class! Back with another Silhoutte project. I love this gift box download from Lori Witlock over on the Silhouette store, and I thought it would be fun to pair with this 3-D bow. SO easy to put both of these pieces together, the box folds like a dream! I secured the flap with a velcro dot to hold it closed. I'll let you in on a little secret-this is the perfect size gift box to hold a few rolls of washi for a favorite crafty pal. The perfect gift in my opinion! clean & simple saturday: party time! For my sweet mother-in-law. Heading out to celebrate with her today. Have you seen this month's April card kit over at Simon Says Stamp? Great colors, great papers, great washi tape. But the thing in the kit that I am most excited about? The stamp set designed by Kristina Werner. I just love her handwriting. It is AWESOME! I have played around with these stamps and I just love all the possibilities! If you have not subscribed yet or are on the fence about a subscription, I would definitely recommend it. I love getting a package in the mail each month of goodies where everything goes together perfectly and the papers are scaled to size for card makers. I would get it just for this cool stamp set alone! There are so many possibilities. Would you like to win a kit of your own? The super sweet and always generous Heidi from Simon Says Stamp said I could give a kit away to one lucky reader (Thanks Heidi!). Just leave me a comment on this post by 5pm EST this Wednesday for a chance to win! I will announce a winner on Thursday morning.